Great selection of AUTO ACCESSORIES... oil, anti-freeze, fuses, fuel, oil additives, and more. We accept payment for hundreds of billers. We also sell North American Money Orders. Breakfast, lunch, dinner, and treats for the entire family! Check out our great selection of gift cards for BP gas, movie theaters, restaurants, and retailers. We also have pre-paid phone cards. Check out our grocery section and household items from canned goods, to milk and eggs, to paper towels, toilet paper, and cleaning supplies. We also have pet food. 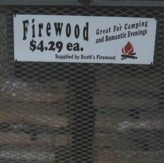 PROPANE tanks and FIREWOOD for outdoor fun!